Judd Hirsch is an American actor most known for playing Alex Rieger on the television comedy series Taxi, John Lacey on the NBC series Dear John, and Alan Eppes on the CBS series Numb3rs. He was born in The Bronx borough of New York City, New York, the son of Sally (née Kitzis) and Joseph Sidney Hirsch, an electrician. His father was also born in New York where the family had lived since the mid-1800s. Sally Kitzis was born in Russia. Hirsch was raised Jewish. He attended DeWitt Clinton High School, located in The Bronx, and later earned a college degree from the City College of New York in physics. Hirsch's first major television appearance was in the mini-series The Law . 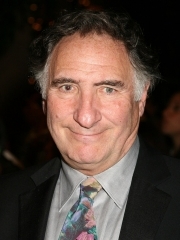 For his performance in Taxi, in 1981 and again in 1983, Judd Hirsch won the Emmy Award for Lead Actor In a Comedy Series. Hirsch went on to play the title character on the modestly successful sitcom Dear John and in 1989 won a Golden Globe Award for Best Actor in a Television Series in a Comedy or Musical for this role. He later teamed with Bob Newhart in the short-lived comedy George and Leo. He had also previously starred for one season in the series Delvecchio, playing a police detective (1976–1977). In film, Hirsch received a nomination for the Academy Award for Best Supporting Actor for his role in the drama film Ordinary People . Other films in the 1980s include the 1983 drama Without a Trace, the 1984 dramedies Teachers and The Goodbye People, and the 1988 drama Running on Empty directed by Sidney Lumet and co-starring River Phoenix. In 1996, Hirsch portrayed the father of Jeff Goldblum's character in Independence Day, and in 2001 he appeared in the acclaimed A Beautiful Mind. Hirsch co-starred on the CBS Television drama NUMB3RS as Alan Eppes, father of FBI agent Don Eppes and Professor Charlie Eppes . Hirsch and Krumholtz also played father and son in Conversations with My Father, a Herb Gardner play for which Hirsch won the Tony Award for Best Performance by a Leading Actor in a Play. Krumholtz credits Hirsch with jump-starting his career after Hirsch chose him during the audition process for Conversations. Other noteworthy stage performances include The Hot l Baltimore, Talley's Folly, and his starring role in I'm Not Rappaport, in which Hirsch also won a Tony Award in 1986. More recently, Hirsch guest-starred on episodes of Warehouse 13, Studio 60 on the Sunset Strip, Law & Order: SVU and The Whole Truth (which saw him reunite with Numb3rs co-star Rob Morrow), among others, and lent his voice to the animated programs Tom Goes to the Mayor and American Dad! In 1999, he reprised his role from Taxi for a brief moment in Man on the Moon, the biopic of his co-star from Taxi, Andy Kaufman . Hirsch was married to his first wife from 1956 to 1958. He married Bonni Sue Chalkin in 1992 and divorced her in 2003. Hirsch has three children: Alexander, born 1966, Montana Eve born 1994 and London, his youngest son. Whole or part of the information contained in this card come from the Wikipedia article "Judd Hirsch", licensed under CC-BY-SA full list of contributors here.